“We returned home to Vancouver intent on creating a company that made gorgeous products with ethics that our mothers would be proud of...our hope was that by building a successful company in which the story behind the products was as important as the products themselves, we could inspire others to do the same”. It seems they have done just that. 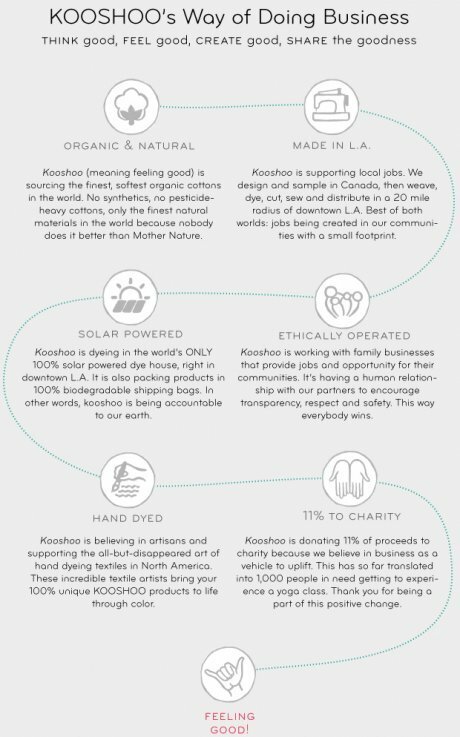 Just over a year ago Jesse and Rachel (by this time husband and wife) launched lifestyle brand Kooshoo through which they designed, produced and sold ethical fashion accessories. Their headbands, hair ties and shawls are made of environmentally friendlier fibres such as Tencel and organic cotton which are dyed (in the world's only 100% solar powered dye house), cut and sewn in downtown Los Angeles. Some of the cloth used in the collections is even woven there too, and all the packaging is recycled and / or biodegradable. This month Kooshoo launched a crowdfunding campaign for their new, and I think stand-out piece - the Journey Shawl. The interest here lies not just in the ethical production and style credentials, but with the very fact that this piece is multi-purpose – it can be worn in twelve different ways. Kooshoo’s aim is for the Journey Shawl - which they see as their ‘direct response to fast fashion’ - to ‘reduce waste by becoming that one invaluable piece that makes any outfit look fantastic.’ It’s versatility would certainly be make it an excellent addition to any holiday capsule wardrobe. Pledge $10 CAD (approx £5.44) or more to be the recipient of a hand written 'Thank You' postcard and a Balinese Wish Bracelet. Pledge $75 CAD (£40.83) or more, and you will receive a hand dyed Journey Shawl in the colour of your choice and a ‘positive affirmation’ organic cotton travel bag. Pledge $275 CAD (approx £149.72) or more and receive five hand dyed Journey Shawls and five accompanying ‘positive affirmation’ organic cotton travel bags. The word ‘Kooshoo’ actually means ‘feeling good’ in Norfolk, a language indigenous to Norfolk Island in the South Pacific, where Rachel and her sister Leilani (also their product designer) are from. Jesse and Rachel have remained true to their yoga roots and in line with their feel good ethos are determined to have a positive impact locally, as well as lessen the negative globally. This is evident in their commitment to donating 11% of their profits to a local charity Karma Teachers in downtown eastside Vancouver, known as ‘the poorest postal code in Canada’. Their support over just one year has funded yoga and meditation classes for 1000 people from a local disadvantaged community. So, should you choose to invest, your money will not only be used to protect the planet but to help look after people too. Find out more by reading on below, and by visiting Kooshoo's crowdfunding page on Kickstarter.